Third round matches at Indian Wells will commence on Sunday with eight matches from the top half and the likes of Simona Halep, Karolina Pliskova, Petra Kvitova, Jelena Ostapenko all in action. For a round-up of day 3 WTA main draw action at the 2018 BNP Paribas Open where nine of the 16 seeds fell, click HERE. Petra Kvitova’s 14-match win streak will go up against the talented 16-year-old, Amanda Anisimova who is breaking new ground in the desert. Anisimova produced a scintillating display to topple the number 23 seed, Anastasia Pavlyuchenkova in straight sets, 6-4 6-1. Kvitova was forced to battle hard, and for over three hours, eventually getting the better of Yulia Putintseva, 6-7(4) 7-6(3) 6-4. This will be the biggest match of Anisimova’s career so far and her first match against a top ten player. Kvitova has oodles of experience going in her favour. Anisimova’s composure has been a delight to witness and it will be fascinating to see how she handles the occasion. I’m tempted to side with Anisimova because I have been *that* impressed with her level during this tournament. I’m going for Petra… just! I think I am more excited about the prospect of this match-up, an all unseeded clash, than the proposed seeded clash between Johanna Konta and Svetlana Kuznetsova! 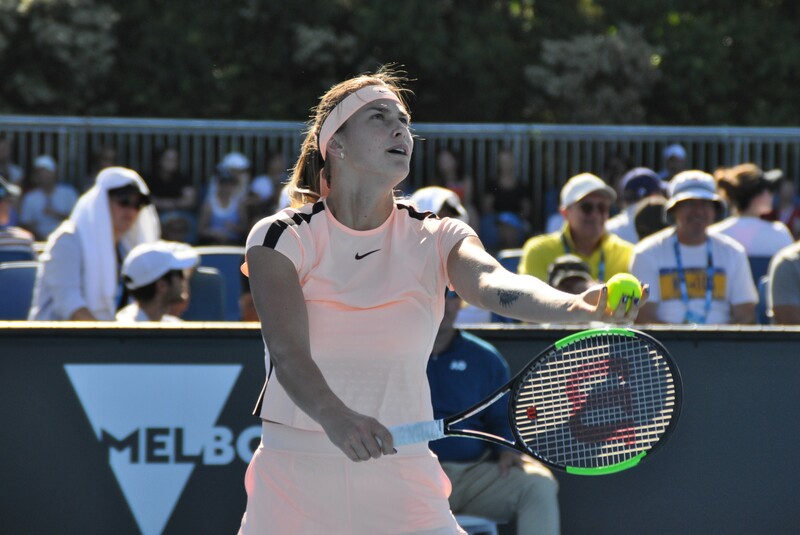 Aryna Sabalenka and Marketa Vondrousova are two of the most talented up-and-comers on tour and demonstrate the depth on tour and the quality of players making their move this year. Both players secured their best wins on the WTA tour on Friday – Sabalenka beat the returning-from-injury, Svetlana Kuznetsova, 6-4 6-3 while Vondrousova saved four set points in a wild opener before edging an equally tight second set against Johanna Konta, 7-6(5) 6-4. The pair have played once before in Biel last year where Vondrousova came from a set down to win in qualifying, 2-6 6-2 6-1. This time round they will be competing for a place in the last 16 of a Premier Mandatory event. I’d say I am more drawn to Sabalenka in general. In terms of this match-up, i’d probably go with Vondrousova who I think may be calmer and more composed, and be able to negate Sabalenka’s rather striking intensity on court. Fingers crossed this one is early because I am really keen to watch it live! I can’t call the third rounder between the number six seed, Jelena Ostapenko and Petra Martic. Ostapenko snapped a three match losing streak with a three set win over Belinda Bencic on Friday, while Martic upset the number 25 seed, Barbora Strycova. In the madness of Friday I didn’t get to watch either match so it’s hard to say with this one. Martic has done well in her comeback to peak at the big tournaments. Her game is legit so Ostapenko will face another challenging match for sure. Kristina Mladenovic and Wang Qiang played each other, Wang scored a double bagel, 6-0 6-0 win in Tokyo! The Chinese player leads the head-to-head, 2-0 and has won both of their previous matches in straight sets. The head-to-head is a curious one. I think i’d tentatively go for Mlads in this one. March 10, 2018 in Day Preview, Indian Wells, WTA. nobody……N-O-B-O-D-Y saves more than 11 match points against Zhuk!!!!!!! The Moo called a close match, but I thought Kvitova would dominate the 16y/o. I was surprised that Amanda could stand toe-to-toe with the power of Petra. In the IW $125K, Amanda defeated 3 good ITF players in straight sets, but was destroyed in the finals by Errani. Are short tricky defender players, Amanda’s Achilles heal? Yep, I was surprised how Anisimova stood her ground. Kvitova didn’t play well but all the credit to AA.